The Hall is divided into different coasts in Texas and some of the troubled species natural to that area are displayed in their natural habitat. The upper coast, characterized by plentiful freshwater inflows, is dominated by salt marsh and oyster reef habitats, the middle coast has a smaller population of humans and less rainfall than the upper coast but with considerable salt marshes and oyster reefs; and the lower coast is semi-arid where the Laguna Madre, the most famous hypersaline lagoon in the world, is characterized by seagrass beds and wind-tidal flats. 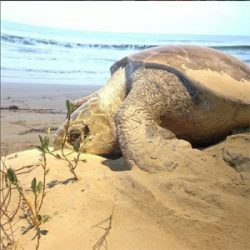 Special dioramas focus on oyster reefs, colonial waterbirds, and the Kemp’s ridley sea turtle of the lower coast and its recovery from near-extinction. Our hearts are deeply saddened by the loss of our Curator of Marine Biology Dr. John “Wes” Tunnell. He provided guidance to the HMNS malacology collection and was instrumental in creating the museum’s Hamman Hall of Coastal Ecology. His expertise and love of sharing the importance of the marine life along the Texas coast is the focal point of our hall. He believed it is important to balance what we take from and how we use the coast. “We now know that a healthy coastal environment leads to a healthy and sustainable coastal economy, so it is important to protect the natural environment.” he said. HMNS also supported a percentage of the publication costs of his last book, The Encyclopedia of Texas Seashells. We are enormously grateful for his years of dedication to HMNS and his unwavering commitment to the education of our visitors on all things related to the oceans and ocean life. We will miss him. The Hamman Hall of Texas Coastal Ecology is generously underwritten by the George and Mary Josephine Hamman Foundation.